عمادة الدراسات العليا بـجامعة الملك فهد للبترول و المعادن تستقبل طلبات التقديم الإلكتروني لبرامج الماجستير و الدكتوراة بالجامعة – فصل خريف ٢٠١٥م، و من هذه البرامج برنامج ماجستير فيزياء طبية. بدأت عمادة الدراسات العليا بـجامعة الملك فهد للبترول و المعادن استقبال طلبات التقديم لبرامج الماجستير و الدكتوراة بالجامعة – فصل ربيع ٢٠١٤-٢٠١٥م، و من هذه البرامج برنامج ماجستير فيزياء طبية. آخر موعد لاستقبال الطلبات هو ١٥ سبتمبر ٢٠١٤م. بدأت عمادة الدراسات العليا بـجامعة الملك فهد للبترول و المعادن استقبال طلبات التقديم لبرامج الماجستير و الدكتوراة بالجامعة – فصل خريف ٢٠١٤-٢٠١٥م، و من هذه البرامج برنامج ماجستير فيزياء طبية. آخر موعد لاستقبال الطلبات هو ٢٧ فبراير ٢٠١٤م. كما أعلنت المدن الطبية التخصصية في المناطق الشرقية و الشمالية و الجنوبية بالسعودية عن توفر فرص إبتعاث داخلي للسعوديين في برنامج ماجستير الفيزياء الطبية بجامعة الملك فهد للبترول و المعادن، و هناك فرص أيضا للإبتعاث الداخلي للطلبة المتميزيين بكالوريوس فيزياء في سنواتهم الدراسية الأخيرة و الراغبين في إكمال الدراسات العليا في تخصص الفيزياء الطبية. علما أن آخر يوم لاستقبال طلبات الإبتعاث الداخلي هو ١ مارس ٢٠١٤م الموافق ٢٩ ربيع آخر ١٤٣٥هـ. التقديم الإلكتروني على برامج الماجستير و الدكتوراة (و منها ماجستير فيزياء طبية) بجامعة الملك فهد للبترول و المعادن مفتوح حتى 8 اكتوبر ٢٠١٢م. 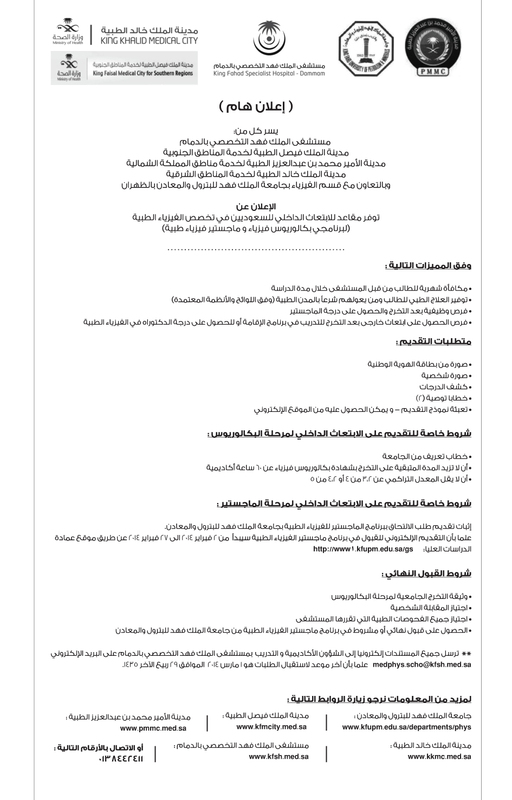 The Deanship of Graduate Studies at King Fahd University of Petroleum and Minerals (KFUPM) is pleased to invite your attention that application to Graduate Studies at KFUPM is now open online from the link http://www1.kfupm.edu.sa/gs/application/preonline.asp until October 8, 2012. KFUPM provides full MS and PhD scholarships for distinguished graduate applicants who demonstrate high potential for conducting original research in the fields of Engineering, Sciences and Business. MIT: Clean Water and Clean Energy. Stanford: Oil, Gas and Geosciences. California Institute of Technology (Caltech): Petrochemicals and Polymers. Technical University of Munich: Refining and Petrochemicals. Cambridge University: Oil and Gas. Georgia Institute of Technology (Georgia Tech): Geo-signal Processing and Smart Grids. KAUST: Many research disciplines in Engineering and Sciences. Saudi Aramco(the largest oil company worldwide): Many research disciplines. SABIC(one of the leading petrochemical companies worldwide): Refining, Petrochemical and Polymers. In addition to many world-class universities and industries on different research fields. KFUPM-MIT Collaboration Center on Clean Water and Clean Energy (http://ccwce.mit.edu/). Transformative Research in Petrochemicals and Polymers (http://cid-rpp.kfupm.edu.sa/). Copy of identification (Passport for international applicants / National ID for Saudi nationals / Iqama for residents of Saudi Arabia). Complete official transcripts for BS degree (and MS degree if applying to PhD). Statement-of-Purpose (a one-page essay focusing on career and research goals at KFUPM). Recommendation Letters from academic referees through the online recommendation system after submitting the online application. Certificates for BS degree (and MS degree if applying to PhD) if degrees granted. GMAT score (for international MBA applicants). TOEFL score (min. is 68 IBT for MS and 79 IBT for PhD) or IELTS score (min. is 6 for MS and 6.5 for PhD). Acceptable GRE General score (min. Quant. is 720 (or 156 on the new scale), min. Analytical is 4.0). Deadline for submitting the online application is Oct. 8, 2012. Deadline for uploading mandatory documents is Oct. 15, 2012. Deadline for recommendation letters to be received via the online recommendation system is Oct. 15, 2012. التقديم الإلكتروني على برامج الماجستير و الدكتوراة (و منها ماجستير فيزياء طبية) بجامعة الملك فهد للبترول و المعادن مفتوح حتى ٤ مارس ٢٠١٢م. 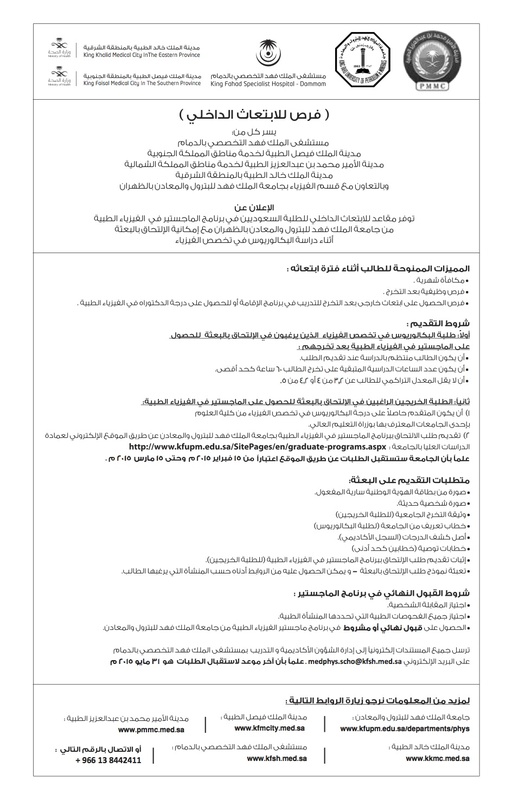 The Deanship of Graduate Studies at King Fahd University of Petroleum and Minerals (KFUPM) is pleased to invite your attention that application to Graduate Studies at KFUPM is now open online from the link http://www1.kfupm.edu.sa/gs/application/preonline.asp until March 4, 2012. KFUPM provides full MS and PhD scholarships for distinguished graduate applicants who demonstrate high potential for conducting original research in the fields of Engineering, Sciences and Business. SABIC (one of the leading petrochemical companies worldwide): Refining, Petrochemical and Polymers. Acceptable GRE General score (min. Quant. is 720, min. Analytical is 4.0). Deadline for submitting the online application is March 4, 2012. Deadline for uploading mandatory documents is March 12, 2012. Deadline for recommendation letters to be received via the online recommendation system is March 12, 2012. Online application to the M.Sc. Medical Physics program at King Fahd University of Petroleum and Minerals (KFUPM) is now open. See the following messge for details about graduate studies application. The Deanship of Graduate Studies at King Fahd University of Petroleum and Minerals (KFUPM) is pleased to invite your attention that application to Graduate Studies at KFUPM is now open online from the link http://www1.kfupm.edu.sa/gs/application/preonline.asp until October 12, 2011. KFUPM provides full MS and PhD scholarships for distinguished graduate applicants who demonstrate high potential for conducting original research in the fields of Engineering, Sciences and Business. Stanford: Oil and Gas research. Technical University of Munich: Refining and Petrochemicals research. Georgia California Institute of Technology (Georgia Tech): Geo-signal Processing. SABIC (one of the petrochemical companies worldwide): Refining, Petrochemical and Polymers research. Many other world-class universities and industries on different research fields. National Center of Research Excellence on Nanotechnology (http://www2.kfupm.edu.sa/cent/). National Center of Research Excellence on Renewable Energy (http://corere.kfupm.edu.sa/). National Center of Research Excellence on Refining and Petrochemicals (http://core-prp.kfupm.edu.sa/). National Center of Research Excellence on Corrosion (http://core-c.edu.sa/). Center in Development on Transformative Research in Petrochemicals and Polymers (http://cid-rpp.kfupm.edu.sa/). Center of Excellence on Maintenance (http://se.ikfupm.com/department/ce/ceim/). Center of Excellence on Supply Chain Management (http://se.ikfupm.com/department/ce/cescm/). Certificates for BS degree (and MS degree if applying to PhD) if available. Deadline for submitting the online application is October 12, 2011. Deadline for uploading mandatory documents is October 19, 2011. Deadline for recommendation letters to be received via the online recommendation system is October 19, 2011.